TUCSON, Ariz. — If you ever felt like giving up hope, read this story. 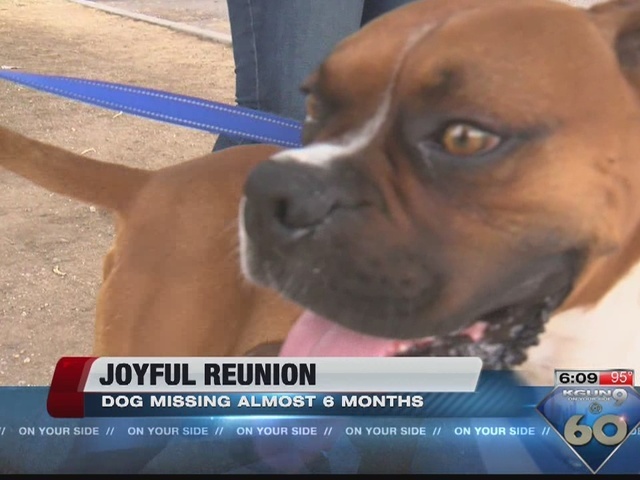 Ozzie the Boxer is back with his people, almost six months after he was stolen from his family's yard. How he returned is a remarkable story. It's hard to tell who's happier: Ozzie the Boxer, or his owner Chris Sanchez. Ozzie disappeared from the family's yard in January. Chris had been searching, hoping and praying ever since. "It's like losing ... I lost my child. That's basically what it felt like. Raised him from basic one. I got on Craigslist, got on Facebook, got on everywhere that I could get on to try to see if someone had seen him." But if anyone saw Ozzie, they never spoke up. "Last week I prayed about it. I said just 'Lord, do me a favor. If he's safe where he's at and he's happy, then I'm okay with that. But if he's not and he's not happy or something's wrong please, do me a favor and let him come back to me.'" For almost six months Ozzie's family kept the faith, and kept checking Facebook. Chris Sanchez says, "My better half texted me and says, 'Look at your Facebook,' and I got on my Facebook and looked and I was like, 'That's my dog! That's our family dog! That’s our dog.'" Sunday a group called Tucson Cause for Canines was searching for a different stray dog, just north of a sad stretch of land near the airport so notorious for abandoned animals it goes by the grim name of Dogpatch. Ozzie came running up and brought a friend---this female Boxer they're calling Riley until they find her family and learn her real name. Mindy Lane from Tucson Cause for Canines is one of the people who found Ozzie and Riley; or you could says Ozzie and Riley found them. “That's always our number one priority is finding their home, finding the people who love them most and reuniting them so this is a really great story and a really great win for us," she said.